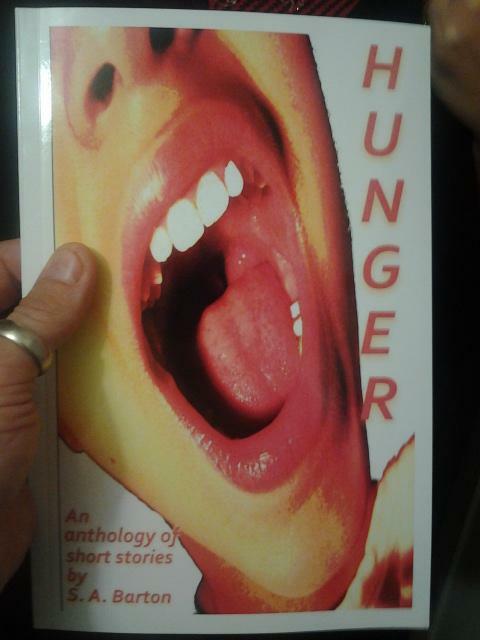 Today, the proof copies of my Hunger anthology arrived. It is, of course, still available in ebook form from just about any of the links to the right of this post with the possible exception of Collins Booksellers of Australia which seems to have to wait a bit longer than the others for new titles. But that’s not the point. This is the first time I have held a physical book with my name on it as author. Barring any major problems—and I haven’t found one yet—it should be available from Createspace in a few days and from Amazon about a week after that. If you choose to read it, ebook or traditional hard copy, I hope you enjoy it. I know I have enjoyed creating it and putting it out there. Congrats, Stu. I’ve got the eBook version of this, but a hardcopy version might look good on my shelf.